There is nothing I dread So much, as a Division of the Republick into two great Parties, each arranged under its Leader, and concerting Measures in opposition to each other. The two parties have a duopoly, comparable to the market dominance of Boeing/Airbus for building jet airliners and Coke/Pepsi for colas. In the 2016-18 political cycle, the two parties raised $16 billion nationwide. Politics is an industry with significant economic impact. Voters see their political options through a two-party lens, without a consistent third choice. Corporations shift their political contributions to support the party in power. As political power shifts, contributions flow back and forth between the two parties, but not to a third-party alternative. If political parties were businesses, then it might be possible to use Federal anti-trust laws to force a realignment to create more competition. Because the political parties are not regulated by the Federal Trade Commission, there are no requirements to lower barriers to entry for third parties, such as requirements to get candidates listed on the ballot. Katherine Gehl and Michael Porter, co-authors of a Harvard Business School report, "Why Competition in the Politics Industry Is Failing America," argued that the two parties are happy to divide the market between them. They work together to block further competition. From their perspective, controlling the market - including candidates, contributions, lobbyists, data - is more important than delivering service to their customers. Partisan gridlock is a business stimulant rather than a measure of business failure. The result of gridlock is an increase in revenue for political campaigns run by the two parties. GEHL: So you have media and political consultants, and lobbyists, and candidates, and policies, all divided onto one of two sides. PORTER: What you see is, the system has been optimized over time. GEHL: For the benefit of private gain-seeking organizations, our two political parties and their industry allies: what we together call the political-industrial complex. GEHL: ...Generally, in industries where customers are not happy and yet the players in the industry are doing well, you’ll see a new entrant. You’ll see a new company come into business to serve those customers. 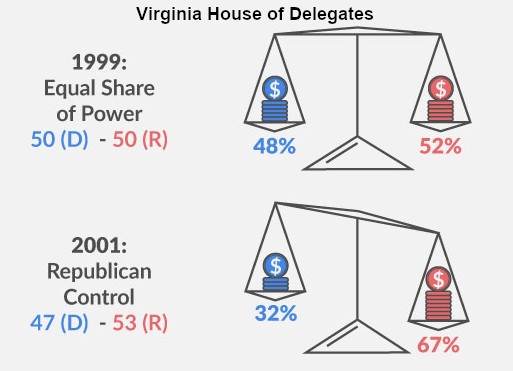 Independents have succeeded in getting elected occasionally in Virginia. The most significant races in which an Independent was elected were in 1970 and 1976, when Senator Harry Byrd Jr. won re-election while avoiding being labeled as a Republican or as a Democrat. In theory, all candidates for local School Board seats and for all Soil and Water Conservation Districts run as independents. Those races are supposed to be non-partisan, and the ballots for those offices do not list the political affiliation of the candidates. In practice, political parties endorse candidates in almost all races, and volunteers associated with the parties are key in getting out the vote for such low-turnout races. 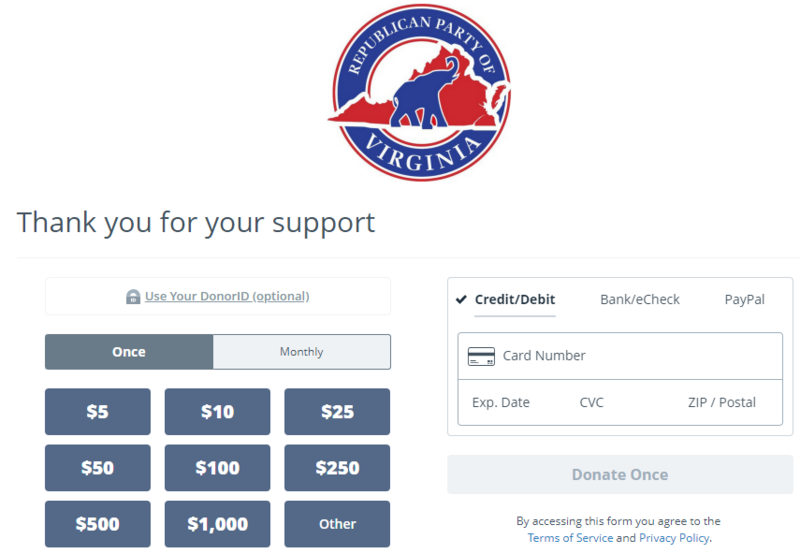 In addition to the Democratic and Republican parties, there are other organized political parties who field candidates regularly in Virginia. 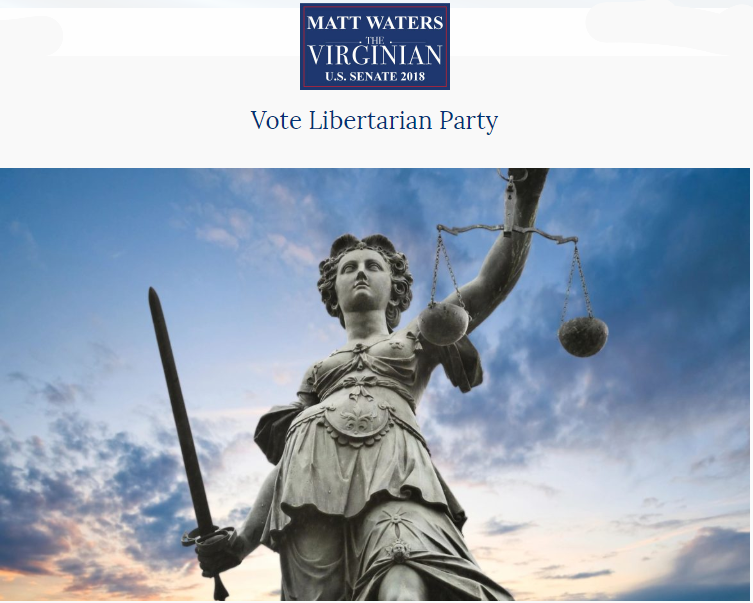 The Libertarian Party was organized enough in 2008 to get eight candidates on the ballot in Virginia's 11 Congressional districts. To get those candidates into the races, the party had to collect 1,000 signatures from qualified voters in each Congressional District. That required having a sufficient number of volunteers, or sufficient funding to pay contractors, to collect valid signatures. In the 1965 race for governor, the Conservative Party candidate William J. Story attracted over 13% of the statewide vote and won 12 counties. His appeal was to segregationists, at a time when both the Democratic and Republican candidates were seeking support from black voters. The head of the American Nazi Party, George Lincoln Rockwell, also got on the ballot. His 5,000 votes were another reflection of the support for legal segregation at that time. Collecting signatures is expensive and a drain on volunteers who might otherwise be generating support from voters. Nominees of some political parties are not required to go though the signature collection process. For the statewide offices of US Senate, Governor, Lieutenant Governor, and Attorney General, nominees not associated with a recognized political party must get 10,000 signatures, including at least 400 signatures from qualified voters in each of the 11 congressional districts. "Party" or "political party" means an organization of citizens of the Commonwealth which, at either of the two preceding statewide general elections, received at least 10 percent of the total vote cast for any statewide office filled in that election. The organization shall have a state central committee and an office of elected state chairman which have been continually in existence for the six months preceding the filing of a nominee for any office. Independent candidates not associated with any political party can get on the ballot. Candidates never backed by a political party have a difficult time getting name recognition, and rarely attract more than a smattering of votes. 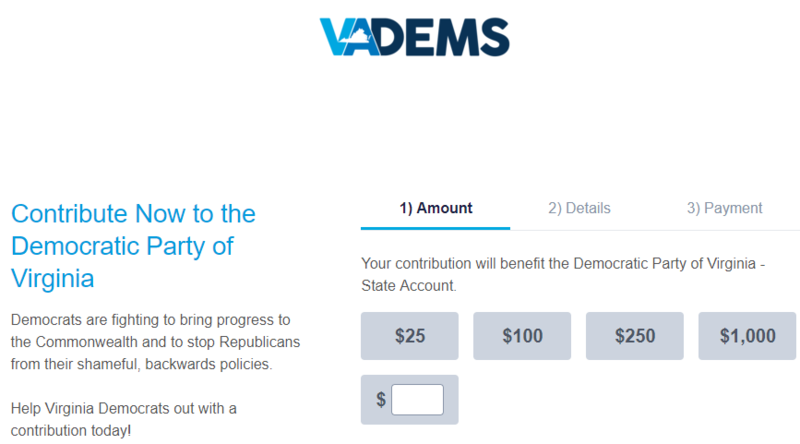 Virginia has yet to see a race where an extremely rich person self-funds a race for office as an independent and wins. Other than the success of Senator Harry Byrd Jr., the most significant impact of an independent candidate was in 1994. Marshall Coleman pulled enough votes away from the Republican nominee for US Senate, Oliver North, to allow Sen. Chuck Robb to win re-election. Robb spent $5 million and got 45.6% of the vote as the Democratic Party nominee. Oliver North, as the Republican Party nominee, spent $18 million and got 42.9%. The spoiler in the race, Marshall Coleman, had been elected as Attorney General in 1977 and been the Republican candidate for governor in 1981 and 1989. He received 11.4% of the vote, primarily from Republicans who could not support the party's nominee. Both Robb and North were damaged candidates in 1994. Robb's extramarital affairs allowed North to link him closely with President Bill Clinton, in a year when a wave election led by Newt Gingrich gave Republicans control of the US House of Representatives for the first time since 1956. North had been part of the Iran-contra affair, though on appeal his felony conviction for telling lies to Congress while under oath was overturned. ...a document-shredding, Constitution-trashing, Commander in Chief-bashing, Congress-thrashing, uniform-shaming, Ayatollah-loving, arms-dealing, criminal-protecting, resume-enhancing, Noriega-coddling, Society Security-threatening, public school-denigrating, Swiss-banking-law-breaking, letter-faking, self-serving, election-losing, snake-oil salesman who can't tell the difference between the truth and a lie. Traditional Republican leaders, including Senator John W. Warner and former President Ronald Reagan, refused to support North. Nancy Reagan's condemnation twelve days before election day was seen by pundits as the turning point in the race. Republicans who intended to vote in their district's US House of Representatives race that year, but could not support Oliver North for the US Senate, had the option of voting for a well-known Republican who did not happen to be the official nominee of the Republican Party. You can choose Marshall Coleman. In certain cases the independence of candidates is highly questionable. In 2018, two races demonstrated how political partisans can try to siphon votes away from an opponent by assisting a so-called independent candidate. In the Second Congressional District, the incumbent Republican Rep. Scott Taylor anticipated a close race for re-election. After the Democratic primary, his staff assisted the losing candidate, Shaun Brown, in an effort to get her on the ballot as a independent. The hope was that Democratic voters would split their votes between the party nominee and the "independent" Shaun Brown. Dividing the Democrats might allow the Republican to win, with perhaps less than 50% of the total vote but more than either opponent. Shaun Brown had been the official Democratic candidate in 2016, and she lost that election by 23 points. In 2018, Elaine Luria defeated her in the Democratic primary, but Shaun Brown still had broad name recognition as a Democrat. Staffers working for the Republican candidate helped her gather the 1,000 signatures needed to get her name on the 2018 ballot as an independent. The plan backfired because the public radio station WHRO and then The Virginian-Pilot examined the petitions submitted to the Virginia Department of Elections. They found forged signatures, including those of four dead people. In response to a lawsuit filed by the Democratic Party of Virginia, a Richmond Circuit Court judge ruled the petitions to get Shaun Brown on the ballot as an independent were invalid. The judge declared the petitions were "out and out fraud" and blocked her from being listed on the ballot as a candidate in the Second Congressional District. There's no hurry... It looks to me like there already was some poetic justice served down there in Virginia Beach to Mr. Taylor. A Democratic operative was more successful in that same year, siphoning perhaps enough votes from a Republican candidate to flip an election. Three candidates were listed on the ballot for chair of the Prince William County School Board. Though the seats on the School Board are theoretically non-partisan and ballots do not identify the party affiliations of candidates, the Republicans endorsed one candidate and the Democrats endorsed another. A third candidate, Stanley Bender, received no endorsement from either party and hardly campaigned. The Democratic candidate defeated the Republican candidate by 10,043 votes. The third person on the ballot, Stanley Bender, received 14,351 votes - almost 10% of the total. His vote total may have been due to a last-minute effort by the former chair of the county's Democratic Party. That operative created a political action committee (PAC) after the last date to report campaign contributions before the election, then had "Republicans For Stanley Bender" signs posted at polling places. 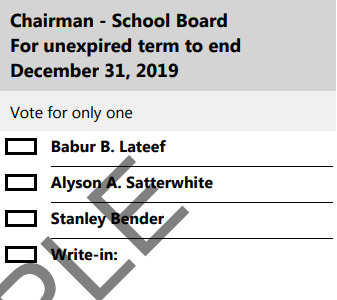 That school board race had received little media coverage, and a significant number of Republican voters were probably unaware that Stanley Bender was not the officially-endorsed candidate. He raised only $100 and spent none of it. In contrast, the Democratic candidate spent $90,000 and the Republican candidate spent $14,000. On election day, the "Republicans For Stanley Bender" signs were a surprise. Because they were posted by a legitimate, registered political action committee, the outraged Prince William Republican Party could not legally remove any of the signs that day. The Republican Party later claimed that the candidate had not authorized the committee and called for an investigation by the State Board of Elections, but that occurred after the vote was certified. The last-minute sign campaign was designed to split the Republican vote. Getting Republican supporters to vote for a third candidate, not the person actually running with Republican Party support, may have enabled the Democratic candidate to win with less than 50% of the total vote. However, that third-party candidate got 10% of the absentee vote, suggesting that the election-day signs may not have increased his share of the vote significantly. Three weeks after the election, the local Commonwealth’s Attorney announced that a special prosecutor would investigate the political action committee for a criminal offense. The Prince William Commonwealth’s Attorney had a close relationship with the individual responsible for placing the signs, who had been chair of the county's Democratic Party committee. A special prosecutor from Loudoun was chosen to pursue the criminal case.